With sew-holes and tears to the spines, these nevertheless rare issues were pursued to over £500 each. We had previewed these Dandys in our June catalogue letter as they, along with numbers 10 - 18, were the remaining copies extracted from 2 early bound volumes (thankfully untrimmed but with the aforementioned spine holes) that we had offered over the last two years. Our collectors responded positively with £75-100 each bid for the balance. A great way to put some early gems into their collections without breaking the bank as Fine copies would easily fetch two or three times these amounts. 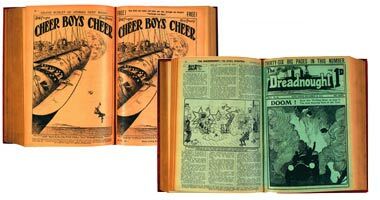 Our early bound volumes of boy's comics continue to attract over estimate winning bids with Cheer Boys Cheer and Dreadnought both from 1912 including first issues making over £200 each. 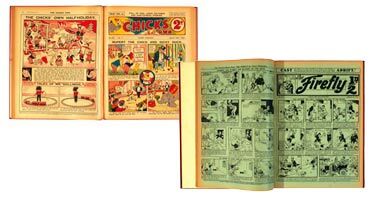 Firefly and Chick's Own were offered in two bound volumes each, including first issues, and £250 and £182 winning bids were received. 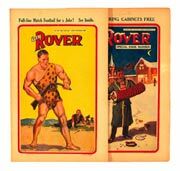 With England's hopeful success in the World Cup competition, Football and Sports related story papers from the 1920s were also in evidence and five lots of early volumes were snapped up between £50 and £100. 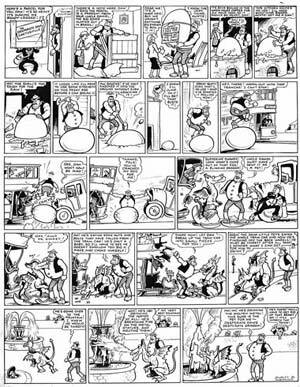 We had not auctioned an early run of DC Thomson story papers for some time and 1930s complete and near complete years were hotly contested to £250-300 a lot averaging out at £5-7 a copy. 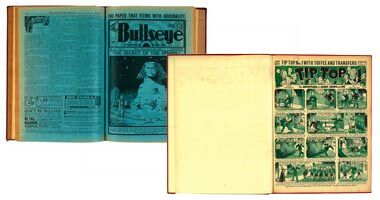 Bullseye continues to hit the target with £138 winning bids for half-year bound volumes and Tip Top's adventures of Jerry, Jenny and Joe topped out at £165 for issues 1-37 from 1934. 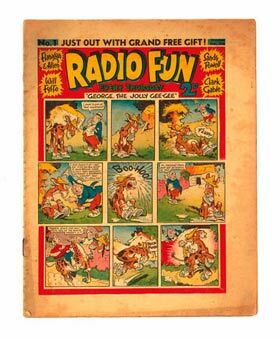 Radio Fun has a strong collector base and early issues are very difficult to come by in reasonable condition as rusty staples often disintegrated into darker staining around the spines. Thankfully the issues we offered were very presentable and No1 took £276, No 3 £62, No 9 £60 and No 11, the first Xmas issue, £75. 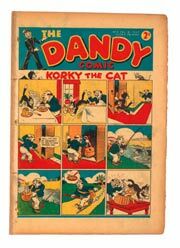 Eight early issues between 19 and 47 made over £20 each and the complete year for 1944 in two bound volumes realised £264. 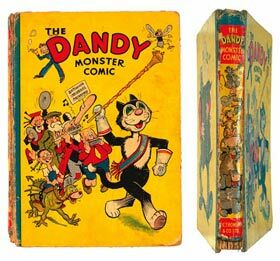 The third Dandy Monster Comic from 1941 is rare and this well worn copy was showing its teeth between spine and boards with half an inch missing from the lower spine. Estimated at £200-250, Korky led the band to an impressive £550. 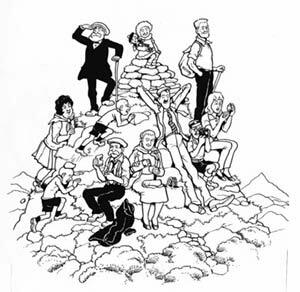 The Broons artwork was well represented. 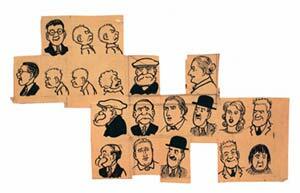 An early "header" group of 20 sketches, mainly used to illustrate the tops of Sunday Post Fun Section pages, was bid to £345 whilst a wonderful page from the early 50s signed by Dudley Watkins showed the neighbours scroungin' off the family for a wee drappie sugar and a fill o' baccy. They get away to their "but an' ben" (bungalow) for the week-end but, help m'boab, the local spongers are worse! £770 was successfully bid. 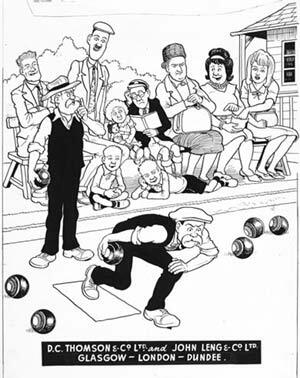 The 1964 Broons Book cover made £680 and had copious notes to the margin by editor, Ian Chisholm including, "Give Paw a sandwich with a bite out…" The final offering was a 1960s page showing Daphne blabbin' whilst Paw was bowlin'. £550 hit the jack. 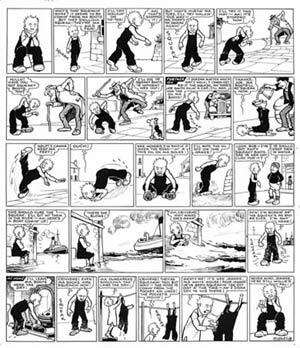 Oor Wullie couldn'ae find the squeak in his auld boots 'til wee Jeannie owned up in the last panel. The mouse roared to £825! Desperate Dan had Easter problems of his own as a giant egg sent by Dan's uncle Daniel, the big game hunter, hatched into his favourite pet, a desperate dragon! A fire-breathing £760 was tendered. 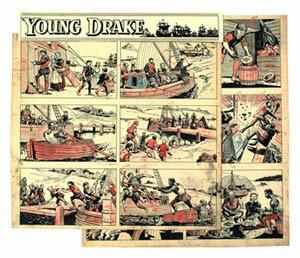 Young Drake illustrated the early adventures of Sir Francis Drake, drawn by Paddy Brennan for The Dandy in the mid 50s, and these first two pages made a swash-buckling £330. There will be a further two pages in our September auction. Eagle comic early issues did well with No 1 [vg] at £165, No 2 [vfn] at £95 (a new record) and 3 and 4 [fn+] at £52 each. Later volumes from the mid Fifties averaged £2 a copy. 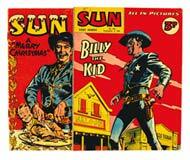 We offered a good run of Comet and Sun issues between 1954-59, with many complete years. Strong interest and multiple bidding realised highs of over £4 a copy, a good average when you consider that over 500 issues were auctioned. 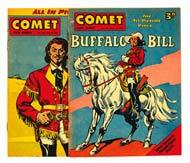 From the same era a run of 12 consecutive John Wayne comics published by WDL shot to £108; that old cowpoke keeps a-comin' back for more. 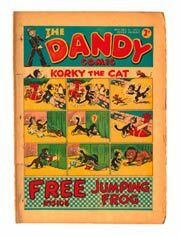 Davy Crockett was indeed King Of The Wild Frontier when complete years of Knockout, 1953-58, also realised £4 a copy for a total of 300 issues. Our star feature from the 1960s comprised a complete run of TV Century 21, 1-242 in 13 lots, all successfully carried away by one determined fan who paid £2,288 for them. He later told me that he had never seen a complete run ever offered for sale in 35 years of collecting. 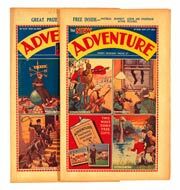 Our US section highlighted a fine selection of pence-copy first issues in mid grades led by Avengers at £154, Daredevil at £138 and Fantastic Four [gd+] at £605. A Very Fine Plus FF #48 made a galactic £243. The Hulk #1 [gd] lumbered to £198, Silver Surfer #4 [vfn-] (and my favourite Silver Age cover) £96 and a very nice copy of X-Men #1[fn+] mutated to £605. Good luck to England in the World Cup and happy Summer hols.